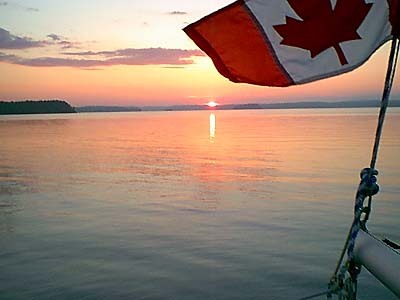 The fireworks will soon start where the sun is now setting over the distant town of Mahone Bay on Canada Day 2000. Photo taken from a small sailboat anchored off Covey Island. For more pictures of Mahone Bay the bay, see the "Mahone Bay - the bay" gallery.